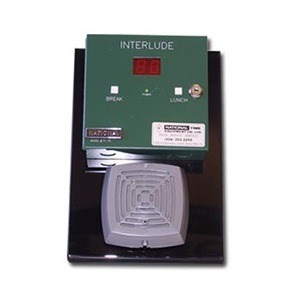 The SONACHRON® Program Timer is Ideal for Schools and Industry. Improves Attendance, Organizes Schedules, Control Lunch Breaks, Controls HVAC, Lights or other Electrical Equipment. If desired, a dip switch can be set for operating the unit as a control device. As a control device, the relay latches ON or OFF according to your schedule. A keypad allows easy programming and changes to schedule(s) for operating the internal 10 AMP dry contact relay. Program the weekly schedule with up to 1,440 events. Each event includes the day(s) of the week and the time. If you wish to signal lunches and breaks manually, press the START LUNCH or START BREAK key to sound the break-start bell. Warning and end-of-break bells automatically sound when the break is over. Signal duration can be set from 1 to 99 seconds. If desired, a 4-digit security code entry can be required by keypad for preventing unauthorized tapering of schedules. 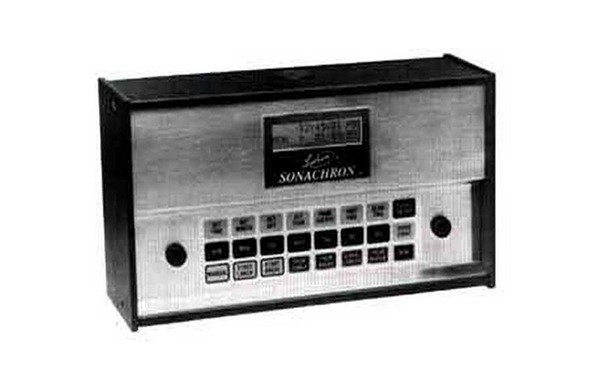 The SONACHRON® can be connected to an OMN:CHRON II® time recorder when it is necessary to synchronize the bells to the OMNI:CHRON II®. If desired, Daylight Savings Time changes can automatically occur on the last Sunday in October and the first Sunday in April at 2:00 AM. In internal battery retains memory and timekeeping during power failures lasting up to 10 days. Battery recharges automatically when power resumes. Quartz time base provides accuracy of ± 2 minutes per year. Knock-outs are provided for easy wiring and installation. Input Power: 20 watts max.